I really enjoyed walking around the city during last year’s mural festival, and was therefore really excited about this year’s Wide Open Walls project! Now that we live downtown it was much easier to walk around documenting the murals in their different states of progression. Over 10 days during this past August 40 or so artists and walls were paired together all around Sacramento, and we now have the luxury of seeing a ton of new and beautiful artwork every day. As we are always on foot I haven’t been able to capture them all yet, and I have progress pictures of some and not of others (I was only a few weeks postpartum AND it was over 100 degrees). I will be adding to the gallery every time I come across a new one. Also, it was impossible to get a good, full picture of the Artners Collaborative mural, but it’s amazing, and they deserve a blog post all to themselves in the near future! You can find a list of artists and locations right HERE (I think some of them changed a little, and I know there is at least one extra one not on the list). I still need to get up above 27th St to see those up there(especially to se Bryan Valenzuela’s mural as I loved what he did for the Art Street project earlier this year), and down to Oak Park to see those there too. It’s really, really worth it, believe me! Wide Open Walls 916 will also be hosting a Street Art Mural Jam on October 21st. I will be at Aftershock that weekend, but I’m definitely looking forward to seeing how the block turns out afterwards! You may have remembered when I posted about an abandoned hotel that had become a temporary art exhibition last year (see ArtHotel), well the M5Arts collective is back again this year with another temporary exhibit, ArtStreet. This time the project takes place inside and around a huge warehouse in downtown Sacramento and features over 100 artists from all over the world. Cesar and I spent ages walking around all of the different installations earlier this week, depicting so many stories: sadness, despair, hope, love, current events, degradation of society, history among many other themes. So inspiring, I really wish that it was a permanent feature in the city rather than just temporary. Of course I took a bunch of photos of as much as I could, feeling more and more inspired with every step. If you are one of the artists who participated or you know anyone who did, please don't hesitate to tag in the comments. You can also find a full list of all artists here. Chalk It Up is a three day festival held in Fremont Park, Sacramento every year to help raise money to fund children's art education and activities in the area. There are sponsored (paid) squares and community (free) squares, music, vendors and food, covering the entire park. We went on the first day and I was impressed by how much talent there was compressed into one small area! It's a fantastic way to raise money for a great cause and gives all kinds of artists and kids a place to showcase what they can do. You can see all of the photos HERE. I‘ve photographed a lot of street art over the past ten years, mainly in NYC, often just random shots during my walks around, camera around my neck or in my bag. There is so much freedom, diversity, and talent in this art, paintings that sometimes appear overnight under the cover of a darker sky, or sometimes just commissioned by a company. I love walking around a corner to see a mural staring back at me, or finding a tiny little sketch in a corner, hidden by a colourful tag. Streets shouldn’t be perfectly bland and clean, they should be flamboyant, dusty and loud, full of each and every one of us. Streets should represent us all and streets should change over time, capturing our thoughts and actions, portraying what we are and where we are going. Art isn’t meant to be kept behind lock and key, art is for us all to appreciate, take in and assimilate, look at and smile. We have so many forms of expression and visual art is one of the most evocative and also the one most open to interpretation. It always makes me happy to be in a city that allows artists to freely express themselves on walls and railways and bridges. It’s sometimes hard for me to walk around Sacramento. I still feel a little disconnected, slightly lost, and wonder why everything is just so quiet. I’m slowly getting more used to it, and continue to walk around hoping to find that part of me that I left back in NYC 7 months ago. I may never find it, as it’s probably just waiting for me to come back, but I am finding that there are more and more things that inspire and motivate me. The Art Hotel 916 back in February for example, and just recently the Sacramento Mural Festival. The festival took place between August 20th and 27th and involved 11 artists (and some assistant artists) and 11+ walls around the midtown and downtown areas of Sacramento. During the week the artists each created a mural (or more than one mural) for us, the people who walk around the streets of Sacramento. These 11 artists (Add Fuel, Alicia Palenyy, Andrew Schoultz, David Fiveash, Dog and Pony, Drew Merritt, Irubiel Moreno, Jake Castro, Kristin Farr, Michelle Blade, and Nate Frizzell), were picked earlier in the year (thankfully they made sure to represent some local artists too) and all went out of their way to really make some buildings and alleyways look spectacular. You can find more information on the official website, including a map of locations and artist bios. I walked around the area on the 20th, the first day of the festival, where some of the artists were just starting up, laying the foundations of their work. I then went back again on the Tuesday, August 23rd, and took more photos, walking around the J, K, and L streets, and then over towards Old Sacramento, and shot some of the works in progress. And then back again during the day on the 27th to see some of the pieces getting their final touches and others already finished and dried. The only mural I didn’t manage to get to was Dog & Pony’s over on C Street, and as soon as I do I will add some pictures to the album. Other than that I have seen every mural in some form or another, and most of them more than once. While I have my own personal favourites, every single piece of art is super original, beautiful and inspiring. To take an idea and to recreate it over such a vast canvas takes such skill, and it was amazing to see it happening in real time. I chatted briefly to Irubiel Moreno about just how beautiful I found his mural to be, and he was so humble and friendly, explaining that it was all for us, people of Sacramento. He also told me that he didn’t know exactly what he was going to do or how it was going to turn out until he had actually finished it. The pastel colours were a wink to the name of the location, Lavender Heights, and I found that the sheer amount of work that he put into the mural over the space of a few days was just spectacular. I’m really looking to go back and see the final, final result, and again, stroll through the streets of Sacramento and discover more. Sacramento is all-in-all a beautiful city, still hovering between small town and big city, and for its size has a huge amount of artistic incentives, festivals and exhibitions. I need to get out and about more to join in. You can find the full album of photos taken last week HERE, as well as a collection below. If you know of any events that you think I would enjoy around here I would love to hear about them, and maybe even join in! All photos taken with a FujiFilm XE-1 and a Canon Rebel. The Petting Zoo: We went there nearly every day. I only wish that it were a little bigger because it could get a little crowded at times, especially where there were too many adults inside. Luna absolutely adored being with all of the animals, especially the baby goats and pigs. I loved how sweet all of the animals were, even the deer who try to eat your clothes, and how happy the children (and adults) were inside. The horse racing: This was my favourite! The anticipation, that short moment when the horses fly by, the roar of the crowd when the winner crosses the line. It was so much fun to photograph too, trying to get them all in the frame before they are gone. I do wish that the races had been earlier in the day though, mainly due to the heat! The fairgrounds: I'm not a big fairground ride person, I usually feel like I'm going to die and that takes away any fun for me. However, I LOVE walking around, the lights, the smells, the happiness and watching all of the rides in motion. Cesar tried the newest ride, this insane spider-like contraption that holds you upside down high in the air before whipping you down to the ground and back up again... He loved it. Luna screamed at it and I took photos of him high in the air, arms and legs spread out in glee and a look of pure happiness on his face. The pony rides: Mainly because Luna loved it SO MUCH. I think she has developed a pure love for horses thanks to the pony ride and won't stop going on about it! Trigger was her favourite little pony, he was sweet and made funny faces. We are now going to look for a place where she can start taking lessons. The FOOD: SO MUCH TO CHOOSE FROM. Even for a vegetarian there was loads. My only regret is that I didn't get any funnel cake or churros! The exhibitions: I really enjoyed walking around all of the different art and photography exhibitions/competitions. It was wonderful to see all of the amazing work that children and teenagers had produced. So many talented artists! I may enter the amateur photography contest next year for fun. Special mentions: the incredible motocross guys, the adorable lamas and sheep and goats, the music, and the skilift. All in all we had huge amounts of fun and next year I will be making to-do lists so that I can do much, much more! PJ Harvey has always written lyrics that hit me hard in the gut, words that are not only meaningful, but meaningful to YOU, striking you at the core. The Hope Six Demolition Project is no exception to the rest - each song has a poignant message, sometimes angry, sometimes tired and always descriptive, so descriptive that you can easily imagine the scene. These days every window into the outside world is full of rapidly passing images of death, destruction and poverty. So many images colliding together that we are at risk of becoming completely desensitized, and many of us already are. From the comforts of our own lives these images remain images, someone else's reality. Polly Jean takes this album to talk about real issues. Issues that exist both near and far, issues that we love to try to bury under other images which are then buried under sand and walked over. You need to listen to each song, let the melodies wash over you and the words penetrate your mind. Those images she describes won’t leave you alone. This is PJ Harvey’s ninth studio album and is entirely based on her trips to Afghanistan, Kosovo and Washington DC (see what I mean when I say both "there" and on our doorsteps?). She often lets her vocals take the background in the songs on this record, letting her voice blend into the melodies, letting others provide their voices to the cause, and just when you think she is digging herself in too deep she pops right back up again with a cry or a deep yearning plea. People have judged the album, some going so far as to call it "poverty tourism"... But I don't see her getting a thrill out of visiting or writing about areas of poverty or war, I’m sure she's probably making money off of the album, as she most likely does off every album she releases, but that’s beside the point here. I see it more as a way to raise a different kind of awareness. If an artist can't talk about his or her experiences, about the world as he or she sees it, then what are they supposed to talk about? Does everything have to remain PC at all times nowadays? I get that it appears as if Polly Jean is slightly reluctant to actually really say what she feels as the lyrics come across as her describing what she sees and what she's told (maybe this is why the poverty tourism comments? ), but doesn't seem to go as far as to say what her feelings are). Up to us to decide? Most probably. How can you really describe life in a place that you have no knowledge of anyway? In my opinion it’s as if she is describing a scene and telling us to think about it. Use our brains so to speak. I gather that the people of Anacostia took offense to the lyrics of The Community of Hope, and I may have too if I lived there, and that is their right. But I'm not going to take offense to it because I understand what she seems to be trying to do with this album. Look at the bigger picture and see what is happening right in front of you. The way this album was created was pretty original, recorded in front of spectators, with a dividing glass between them. Live, but not really live? I would have loved to have seen the recording. I would have loved to ask her questions she would most likely have not answered seeing as I haven't been able to find one recent interview with her, so I suppose she hasn’t been interested in answering any of the speculation over this album. She's never really been one to explain her intentions anyway, always just lets her music talk for her. So I suppose that's why people are forming their own (sometimes possibly misguided) judgments. In any case, I find The Hope Six Demolition Project to be an excellent body of work, and a great transition from 2011's Let England Shake (which was also completely motivated by actual people, places and occurrences). In any case, the album portrays a certain dissonance and discordance that I absolutely adore, each song completely different from the other, no seamless transitions, jumps from droning vocals, happy humming, aching melodies and harmonies, larger than life back-up singers, hollow sounds, deep basses, clanging bells, happy beats, bluesy guitars... A real melting pot of everything. It really works for me. Like REALLY works. I never look to PJ Harvey to reinvent something that she has already done before; I always assume she will come up with something completely different. She doesn't ever seem to have a comfort level; she just does what she wants. And I love that about her. She will always have a piece of my heart, and so will The Hope Six Demolition Project. Instead of trying to figure out the wheres and the whys and the how comes, it would benefit us all to sit down with a pair of headphones on and listen to the album in full without any distractions. Dollar, Dollar could literally take place anywhere in the world, and if The Orange Monkey doesn’t make you think hard about life in general then you may have some thinking to do. There is much beauty in the fabulous orchestration of the album; it all comes together as one, like a large river passing through different scenes, angrily thrashing through some places, calmly floating past others, touching everything and everyone on its journey to the ocean. I spent many a day roaming around NYC, snapping photos of buildings, signs, art, sometimes even people if I felt confident enough. There was always at least one camera in my bag, digital and/or film. New York City embodies art. NYC IS art. NYC is a huge, moving and continuously evolving piece of art and there is nowhere in the world quite like it (not that I have found in any case). Over the years I captured many pieces of street art on those cameras, from tags to full blown commissioned murals and anything in between. I moved to Bushwick in early 2008 and found layers and layers of amazing art during my walks, blocks of murals and tags; stencils and wheatpastes. Some work was obviously commissioned and legal, other just appeared overnight on an old wall, and left to stay. Some of the art that I photographed is long gone, other work remains in the same place today, but you never know how long anything will last in the city… Street art remains ephemeral. I have only two regrets, one being that I left shooting Five Points for too long and was too late, and the other being not capturing all of the artists names. If you recognize any please leave a comment and I will add the artist’s name. This collection of photos spans over 6 years and three boroughs (Brooklyn, Manhattan and Queens). I used the following cameras: Canon Rebel Ti1, Canon AE-1 (1978 and 1979), Holga and there are a couple that were taken with an iPhone. Artists include: Blaze, Dasic Fernandez, AWR/MSK Crew, TFP Crew, Jesus Saves, Russell King, Bushwick Collective, Goya, Dave-Foto, DYM Crew, YMI Crew. The (large) collection of photos is up on Flickr HERE. The photos featured below are only a small example of all of the images that I have collected over the years! When my sister mentioned her trip to something called the “Art Hotel” last week and sent me some pictures – I knew immediately that it would be something I absolutely needed to see. A building full of art from bottom to top?! Amazing! It really was amazing, and I feel like I was actually lucky to see it in person. The idea was to take a building scheduled to be demolished (in this case the Jade apartment building in downtown Sacramento) and for different artists to transform the insides into a literal art house over the space of a month. The temporary exhibition was only open for a week, from February 5th to the 13th, and we went on the very last day. All of the ticket timeslots were sold out when we got there, but thanks to my mother we were able to get in for a 15 minute visit. I had Aurora strapped in the Ergo so she also got to see some of the amazing artwork, although I doubt she will ever remember! The concept really is incredible. I don’t really know the history of the building and the hotel next door, but from what I have heard they weren’t in the best part of town (although to be honest I wouldn’t have had any idea, coming from a decade in NYC many places you walk down don’t seem to be the most salubrious but that doesn’t really mean anything). In any case 14 artists from all over the world got together and transformed the entire insides of the building into multiple pieces of art: full apartments, rooms, kitchens, bathrooms, windows, halls, staircases, you name it, everything was decorated, painted, and used as part of a prop to capture the visions of each artist. Beauty, nostalgia, love, hate, blood, fear, angst, humour, dirt, purity, horror, smiles, death, life – all separate concepts and emotions that seemed to come together quite seamlessly. 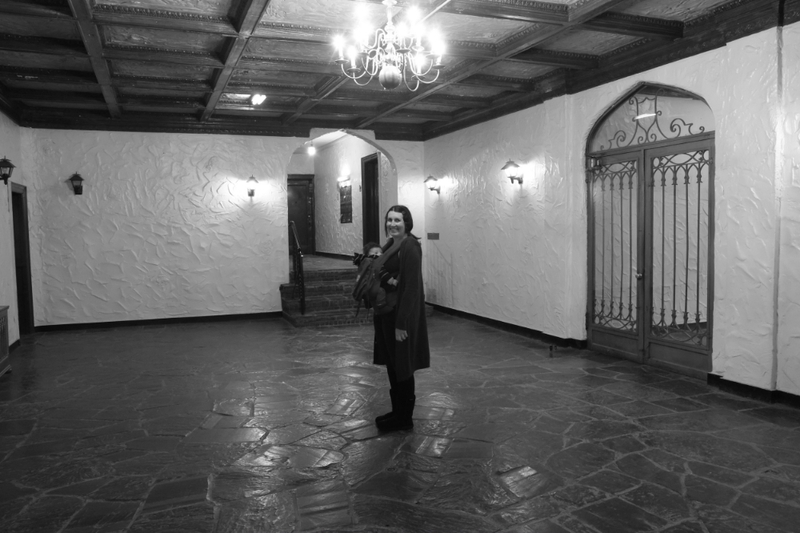 I loved walking through the building, feasting my eyes on each room, hallway and staircase. I love how the entire concept displayed how art really is universal and dynamic, a beautiful mix of talent, space, vision, tools and timing. Art cannot be explained or neatly fitted into a box; it is at times stunning, beautiful, grotesque and outright weird, altogether or separately. I’d love to see some more of these temporary exhibitions and check out more of the different artists’ work. I’ve posted some photos of what really stood out to me below, and you can find out more information on the individual artists on the M5 Arts website and on the Art Hotel 916 Facebook page. My cameras are unfortunately still stuck on our moving truck somewhere halfway across the country so iPhone photos are all I have (and this is only a small sample of everything that I took during my visit). But you can check my mother’s much better images on her blog. Really excited about seeing what other cool and inspiring events Sacramento has to offer! I’ve mentioned in a few posts lately that I have been meaning to get back into photography again. I’ve recently been looking through all my albums full of scanned film prints, all of the street art and street photography I have done over the years. Those feelings that you get when you capture that perfect image came flooding back, the same type of feelings that I get when I write something that makes my heart sing. I want to feel those emotions with photography again, and it really is as easy as making sure I take my camera with me wherever I go, which is what I always used to do. Back in 2012 I saw that FujiFilm were releasing a new line of camera, the X line, and the whole concept appealed to me immediately. My favourite camera is still my completely manual SLR, a Canon AE-1 from 1978, and while I love how perfect and real a digital camera can render a photo, I also love the imperfections of film. Anyway, FujiFilm’s X line is basically a line of cameras that look like old-school SLRs with all the advanced digital technologies. They also have a film simulation option in several choices (colour or monochrome) so that your digital images look like film prints. Perfect for me, right? They aren’t cheap, hovering around the $1,000-1,500 mark, but I saved up and bought it in early 2013. And used it about 4 times. Granted, I had a lot going on, but I guess it was all for a reason as I recently pulled it out of my camera bag and started using it again, and to my delight it’s as good as I imagined it to be. I’m so in love with this camera. Here is an album of shots taken over the past week. I need a lot more time and practice with it, but it’s already got its own little spot in the stroller and comes out with us wherever we go. I have some wonderful models too, although Luna tends to shy away from the camera these days, mainly because it makes her laugh. I suppose it makes for more interesting shots at times anyway. I’ve posted some of my favourites below, but you can check out the album on Flickr here. Our neighbourhood, our home, our friends, our life and things that catch my eyes while out and about. I couldn't sleep last night and was browsing through my BBC News app when I came across an article on the Chinese fashion designer Guo Pei, and how since Rihanna had worn one of her designs she was becoming a worldwide sensation. It reminded me of an article I was commissioned to write back in 2011, where I first discovered this woman's amazing talent. I'm really glad that she is getting the recognition she deserves. When you look at Guo Pei’s designs, the first word that comes to mind is not “clothes”, but something more along the lines of “WOW”. To put it simply, this is art. Resplendent, opulent, beautiful art that you can wear. Guo Pei opened Rose Studios in 1997, when haute couture in China was pretty much non-existent, and is slowly but surely becoming a highly regarded name in the fashion industry, not only in China, but worldwide. Guo Pei is not only the first Chinese haute couture designer, and therefore a trailblazer for Chinese fashion design today, she is also one of the most unique and artistic up-and-coming designers out there in the world. Guo Pei is taking the world by storm with her exquisite designs and is becoming part of the elite group of designers whose creations are considered both fashion and art. In the same vein as Alexander McQueen and John Galliano, Guo Pei’s work is created to wear, but could also easily grace the walls of a museum exhibition. Guo Pei was born in 1967, at the beginning of the Cultural Revolution, and studied at the Beijing Second Light Industry School. Once she graduated she started by working as a dressmaker, gradually working on her own creations as well as commissioned work until she had enough money to branch out on her own with Rose Studio. What is so interesting about Guo Pei is that she did not have access to other haute couture creations outside of China, so all of her designs and visions are completely original, products of her own extensive imagination. There may be comparisons here and there with other highly successful Western designers, such as McQueen and Galliano, as mentioned earlier, but only because of the highly artistic element in her work. Each design that comes out of Rose Studio is exquisitely original and precious. When asked why she chose the name “Rose Studio” for her fashion house, Guo Pei’s response is simple and meaningful: “People love the rose, because of its superciliousness and full-bodied fragrance. But, even when it becomes withered, its beauty still never fades away. This is why I love it. A dead rose gave me a comprehension of departed resplendence; a studio full of affective tone brings me more dreams. So, Rose Studio, blossoming at the forefront of fashion like a rose, is a cradle where I can weave my dream.” And these words describe Guo Pei’s art perfectly. Guo Pei’s designs are the complete opposite of prêt-a-porter wear. She creates serious haute couture in each of her designs. While prêt-a-porter fashion is made for many customers, to wear on a regular basis, Guo Pei’s designs are made to measure for one client at a time. Each design is a separate creation; hand created from scratch, based an individual vision, and, finally, created from the heart. It really is impossible to name each design anything else other than a creation. The words “dress”, “outfit” and “design” really do not do Guo Pei’s work justice. Each piece is a magnificent creation, elaborately designed and developed, rich and artistic, and could easily be considered a museum piece or even a sculpture. It is as if Guo Pei has a vision in her mind of how the outfit is to look on her client, and will painstakingly reproduce this vision into reality. Her creations are artistic and surreal, individual but idealistic. They are portrayals of gothic fairytales that are embellished in China and then introduced to the modern world. Guo Pei’s inspirations come from fairytales and folk stories, cultural tales and a vivid imagination. Far from being stark, each design is opulent, created using beautiful fabrics and accessories and hand-crafted, using only original materials. Guo Pei employs a large team of tailors and hand embroiderers who work full-time putting the designs together in their final form, from cutting the fabric to the exact measurements, to sewing thousands of Swarkovski crystals to one gown (over 50,000 hours of work!). All creations are supervised by Guo Pei herself, to ensure that her visions are produced in the exact way that she wants them to. Because of Guo Pei’s own experience of first studying fashion, then as being employed as a seamstress, and finally as a budding designer and business owner, she knows the industry inside out and knows exactly what it takes to produce each creation as per her high standards. On top of being an extremely talented designer who has built up her reputation by herself, Guo Pei has also had to learn how to develop her own business acumen. Once upon a time Guo Pei would sometimes create her custom dresses at a loss, but nowadays she knows how to use her talent to also bring in the money. Her designs now draw in the interest of many well-known names, and people flock to see her runway collections. While Guo Pei has been a rising star in China for years now, the international buzz that is surrounding her is only recent, and is growing in momentum with her every move. In 2008 she was commissioned to design the dresses of the presenters during the Beijing Olympics, cumulating with the dazzling, diamond-studded dress worn by Chinese singer Song Zuying during the closing ceremony. When asked, Guo Pei considers this design the project that she is the most proud of. Not only did it become an internationally acclaimed design, it was also a wonderful portrayal of national spirit, something that Guo Pei is very proud of having participated in. Guo Pei also designs the dresses of the hosts and performers of the annual CCTV Spring Festival in China, watched by a large percentage of the population in China and by Chinese-speakers worldwide. You just have to see the wonderful designs presented in her collection entitled “1002nd Arabian Nights” to see the intricate, original and opulent designs. Unique and full of soul – each creation contains part of herself, a real product of an artist. From the delicate headdresses, via the majestic and inspired dresses to the hand-made platform shoes, there is not one element of each creation that is not awe-inspiring. Guo Pei’s main advice to other budding designers, in China as well as in the rest of the world, is to love fashion, because “talent cannot work without love”. Other advice is to know how to create a design from scratch, to be able to create from your own hands before employing others to help you. Don’t be afraid to work your way up and put in hours of manual work to develop your skills. Guo Pei’s says that design and business need to be created “by your own hands”. When asked if she plans on opening up her business to the US and Latin American market, Guo Pei’s response is that there is a large market and space for haute couture to develop in the US and Latin America, and it is also “a platform to display your ability”. Once Rose Studio has reached a certain level and once various conditions have been met, Guo Pei will consider a plan to enter the American market. Designer, couturière, artist and smart business woman: Guo Pei is all of these and more! While Guo Pei’s reputation as being the best dressmaker and designer in China is fim, she is just only beginning to become a name in the world of haute couture outside of China. She is bringing her own vision to an established world that is welcoming her with opening arms – this is only the beginning!